If you’ve been living under a rock for the last few years, or you’ve never handled a company social media account we’ll forgive you. You know not your own sin. So if you’re a new business owner, or you’re that poor sod whose boss has just breathed down their neck to say “I think you should do some social media for the company” never fear! We’ve compiled a series of post on how to do social media. Your company has an account. You have your own account. Everyman and his mother has an account. You may think you know what you’re doing, but if the only time you use twitter is to sneakily talk to a friend at work, or to update the world on your lunch (via Instagram of course) chances are you’ll have no idea how to handle a corporate account. And unless you’re the guy at the Waterstones Oxford Street twitter account, tweeting whatever pops into your head, no matter how interesting to you, might just not cut it. The most tweeted events in history are all just that, events. And they all have one thing in common, they are shareable. Take a look at our Infographic below to see Twitter’s biggest success stories. So now you know you need to tweet something shareable, but how is this going to help your site? Well, there’s something you should know: Twitter is not just about getting traffic. the most effective Twitter accounts tweet about human interest 90% of the time and only 10% of their tweets are self-promotional. Twitter is about connecting with an audience, building a brand identity and gaining the trust of potential customers. Oreo are one of the best examples of using Twitter to its full potential. 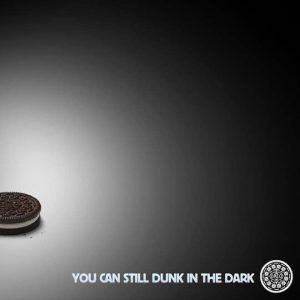 During a power outage at the Super Bowl Oreo quickly came up with a clever gimmick to get themselves noticed. Their Dunk in the Dark tweet garnered 15,000 retweets and showed off Oreo’s “human” side. Your brand might not want the same brand identity as Oreo but keeping up to date with current affairs and tweeting about it can never harm you. So how do you go about getting the following you want? Firstly, set up a Twitter scheduler such as TweetDeck or Hootsuite. You can schedule tweets to go out at any time or day, find out what’s trending with ease, and see all your interactions (including your shiny new followers!) all on one screen. One of the best things about Twitter schedulers is that you can set up all your posts at the beginning of the day and leave it, coming back only to check interactions and breaking news every now and again, so Twitter needn’t take over your whole day. Next, set up an account with a specialised Twitter analyser, such as FollowerWonk, to find out when your followers are most active, which country they come from and their gender. This can help you tailor your tweets to specific events and genders and means that you can schedule tweets for the right time of day. If you run an international business you might find that half of your followers come from overseas, and there’s no point tweeting when they’re all fast asleep. Finally, engage with people, even your competitors. If you think what a competitor has tweeted is great, let them know! Retweet, favourite or reply. You might think you’re bolstering the competition but in reality you’re showing that you have the same brand ethic and knowledge of your product. KitKat a great example of this. When a follower of both brands said she couldn’t choose between the two, the chaps over at the KitKat twitter account challenged Oreo to a game of Noughts and Crosses (Tic-Tac-Toe if you live across the pond). If someone sends you a tweet always reply. If it’s a compliment, say thank you, an insult, try and remedy the situation. If someone has complained about customer service invite them to email you or at least ask them what was so bad so you can fix it. Bad reactions to complaints can ruin a company reputation so think carefully about how to respond; don’t just ignore or delete. Pay attention to your followers, pick a few of your favourites every now and again and tweet them directly; it shows that you care about your customers and value their custom. If 90% of your usage shouldn’t be self-promotion, what should it be? Well the majority of it should be relevant to your product. If you’re a sports brand try running a daily health tips campaign, or if you sell clothing tweet pictures of what your employees where to work (tip: here is where you can self promote, if you’re wearing your brand be proud of it!). When there are big events mention them if appropriate. Heat wave in the UK? Tweet about after-work drinks in the sun; it shows off the human side of the company. But being tactful is important; if a major crisis kicks off somewhere in the world, make sure none of your scheduled tweets could be insensitive in light of events, you’d be surprised how many companies have fallen foul of this. Finally, have fun! For the most part, people like Twitter because it’s funny. Yes, we like to get our news from it, and it can be very effective in keeping people up to date on global events, but most of the time people just want to see something that’s interesting and relevant. So, decide what your brand message is going to be and let people know! If you would like to know more about how a dedicated Social Media campaign could help your business contact us at hello@digivate.com. If you head over to the Twitter homepage (https://twitter.com/) there should be an option to sign up on the right hand side of the page.